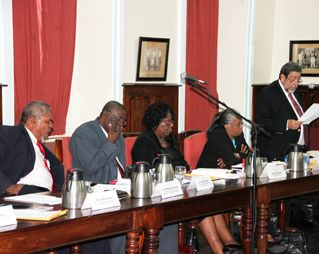 As he responded to a question posed on May 16, by parliamentary representative for the northern Grenadines Dr Godwin Friday, Prime Minister Dr Ralph Gonsalves said while observers all agreed that the 2010 General Elections were free and fair, the issue of the electoral list containing more names than the number physically available in the country has been one plaguing the electoral system for some time. Gonsalves explained that a personâs name can only be removed from the votersâ list after five years have passed and a challenge has been made to the list, or if the supervisor of elections has sufficient evidence that an individual has died. The prime minister said that the electoral office was constantly cleaning up the votersâ list and it is done in an open manner. He said that the names of those who have died are removed from the list on a monthly basis, based on information received from the registry, or the national radio station, the National Broadcasting Corporation (NBC). The process of purging the votersâ list was hampered he said, by not being able to get accurate information on persons who would have migrated. âThere is an opportunity now, however, for a cleaning up of the list for a practical reason which I think the supervisor of elections has put to ULP (Unity Labour Party) and NDP (New Democratic Party) representatives,â Gonsalves said. He explained that there is currently a new ID card in circulation. âClearly the people on the ground will get the new ID cards, but if you are away you will not have the new ID cards â so there is an A list and B list and once we get the core list of registered persons, that is to say, those with ID cards, it makes it easier to go through to see the actual numbers if they are out of the country for more than five years,â Gonsalves explained. This, he said, was discussed among the two main political parties and was agreed upon. In terms of a facial recognition module, Gonsalves said that the barrier to having it here was the economic cost involved. He said a recommendation had been made, however, to have only those who were registered between 2009 and 2014 included on the list and the supervisor of elections made a further recommendation that, beginning July 2013, there should be one year of intense publicity leading up to the July 2014 date.